Is it worth it? To not be fully awake. Is it worth it? To not keep your foot on the brake. Is it worth it? To drive glued to a phone. Is it worth it? To answer the text tone. Is it worth it? To become another statistic. Is it worth it? To drive angry and ballistic. Is it worth it? To not buckle the seatbelt before you leave. Is it worth it? To cause your loved ones to grieve. Is it worth it? To be focused on that site on the right. Is it worth it? To give yourself a fright. Is it worth it? To blare the music for all to hear. Is it worth it? When your life disappears. Is it worth it? To change the radio station right at that moment. Is it worth it? To experience perpetual postponement. SCREECH Is it worth it? When the collision occurs. Is it worth it? When you’ve taken someone else’s life, and yours. Is it worth it? To lose something more valuable than just time. Is it worth it? Think about all that you leave behind. Can we not wait? To see who texted us just then- Can we not wait? To contact our friends- Because in the end we all only have one life, And in that end distracted driving always makes you pay the price. The solution: cannot just come from me. The solution: is happily free. Do not treat driving as a blasé act, For in this way, most of us lack. 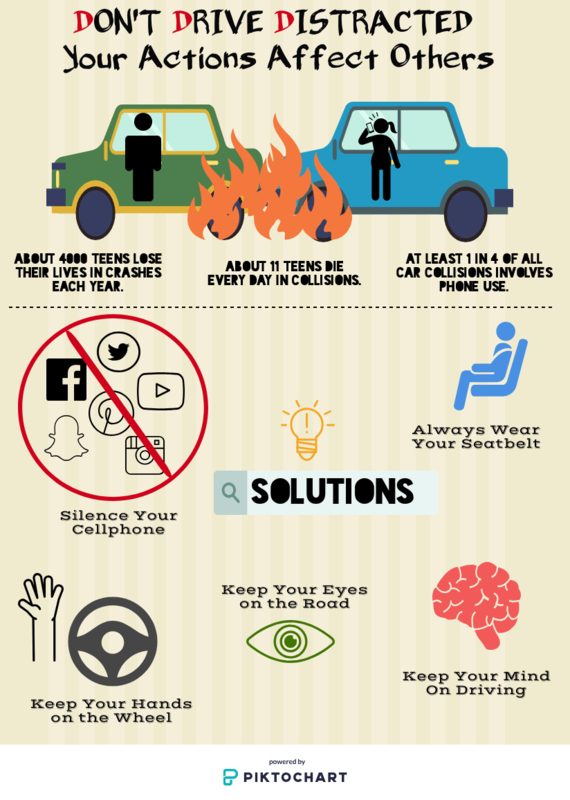 Remember the consequences when you get behind the wheel, Lest you hear the tires squeal. I frantically rush out, all the belongings of mine spill out of my grip as I anxiously lock the door to my home. Kim will be home from school at 3 and it’s his birthday. I forgot. Not the birthday, but the planning. Reminiscing, I can hear him excitedly telling me, “I want a cake for my birthday and a birthday party, pleaseeee!” “I got it Kim!” Shooing away my brother as I was occupied with piles of homework. Time slipped away from me. Today I’m trying to gain that time back on three hours of sleep. I gather my belongings from gravity and walk myself to the car. I throw in my things later finding myself acquiring the driver’s seat. I rotate the key in the ignition and set the vehicle in reverse. With my eyes glued on Kim’s checklist in my right hand and the steering wheel in my left, I quickly exit out of my driveway. Only after noticing the sound of a pedestrian screaming, I become alert and slam the breaks. I look in my rearview and the pedestrian is not hurt, thank god. Although, he did seem disgusted with me. I didn’t have time to worry about that, I was in route to pick up Kim’s birthday cake and time was not on my side. I forgot to put on my seatbelt along the way, but the store was just down the street, it would be quick. I sped down the street hurriedly, making close calls with stoplights and running stop signs where I deemed it to be safe. This was partly because I was in a hurry, partly because I was exhausted. My eyes were heavy and wet from the frequent, ongoing yawns. The destination was only a few blocks down from the right of the approaching stop sign. The dimly lit numbers on the digital clock read 2:38 PM. It was a race against the clock and I refused to be anything but first. I couldn’t disappoint Kim, so I intended to run the upcoming stop sign. The street was usually sound and I knew no vehicles would come from it. At least I thought no vehicles would come from it. They shouldn’t have come from it. I, I thought they didn’t, I thought I looked both ways, didn’t I? I opened my eyes to find myself pressed against a broken windshield and blood leaking from the right of my forehead. My body began to shake furiously, I was in a state of shock, I was dazed. My car was overturned and I landed on my right arm which is now injured. I spent months in the hospital to recover from my injuries and had to attend therapy after I was discharged. I discovered my vehicle had sped onto oncoming traffic causing a collision of three cars only moments after hitting a 15-year-old pedestrian in the crosswalk. Kim never got his birthday party. He waited at home for extensive hours only to discover his big sister hospitalized and his big day ruined. 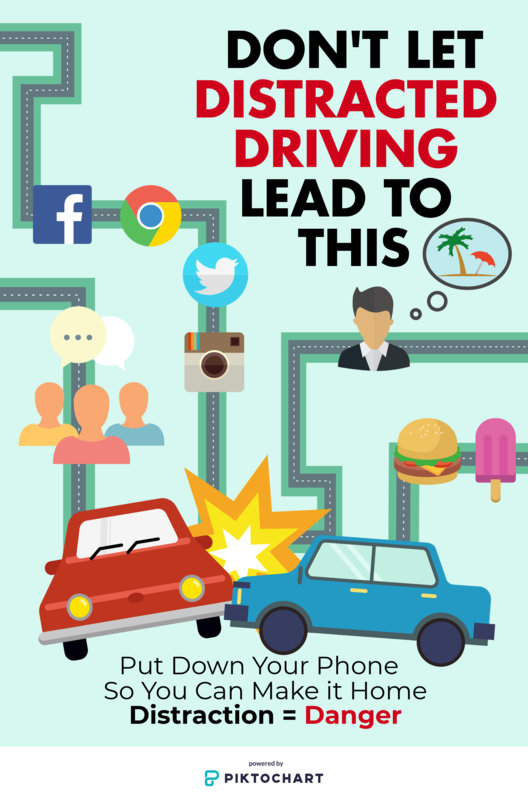 Don’t allow yourself to be distracted by anything while driving whether it’s a phone or a note. Put everything out of sight while driving! You should always wear your seatbelt, no matter how far or near the destination appears. Drowsy driving is not safe driving to any extent, get an adequate amount of sleep before handling a vehicle. Speeding is in no way safe driving and is very dangerous to everyone on the road! You should allow yourself more than enough time to get to your destination and never speed! Please drive safely, you could lose your life or cause someone to lose theirs. Buckle Up & Shush Up! Alexa and I are best friends. We do everything together. We have been inseparable since her mom bought me for Alexa’s sixteenth birthday. I may be just a phone, but I know for a fact that I am Alexa’s best friend. She has tons of friends and is relatively popular, but she talks to me the most. She tells me all of her secrets, and then I reveal them to other people. Alexa’s friends tell me secrets, too. Then I announce them to Alexa. This weekend was going to be so much fun. Alexa’s boyfriend informed me about a party Friday night, and he wanted to know if Alexa would come. I was so excited and told Alexa his exact words. She informed me that she was going to go and I just had to notify her boyfriend. This party was going to be a blast. It was Friday night, and Alexa looked stunning; with her golden curls just right, and her red lips matching her red dress perfectly. The temptation was too great to resist. I had to take a few pictures and send them to her boyfriend. We were finally on our way. Alexa did not put on her seat belt after sliding into the driver’s seat. This made perfect sense to me. After all it would flatten her curls and wrinkle her dress. We were almost halfway to the party when Alexa’s boyfriend responded to the pictures I had sent him. I know it was nearly half because I am Alexa’s GPS. I was so excited about what her boyfriend told me that I could not wait to tell Alexa. She smiled and picked me up. Alexa started to tap my screen with a look of delight. I felt pretty honored to be appreciated so much. Then it ended when she looked up with a terrified look on her face. Then I was on the floor. Alexa was gone. Now it is Tuesday. I don’t know where I am; I don’t understand where Alexa is. I think it was all my fault. I should have waited. I should have been silent and in the purse where I belong. But now it is too late. Distraction can occur in any shape or size. Whether it’s manual, visual or cognitive they could all lead to your tragic demise. Hearing the buzz of your phone ringing in your ear causes your hand to slip from its intended place on the steering wheel. Now your eyes linger for they know this act is wrong, but the road seems clear. So, what’s the harm? Your mind is the last to go, because deep down you know that nothing is more important than keeping your eyes on the road. Focusing gets harder as you long to know just what is held in that tiny screens glow. Let’s say you were oh so strong and refused to take a peek, but your mind is still wandering as you swerve across the street. Now let’s hope that you regained control, because what could have happened next, no one wants to really know. That is what I think of immediately upon the words “distracted driving” hitting my ear,the tiny screen that causes common sense to veer. But there are many forms: the music we blare, the company that’s shared or being more focused on the appearance of your hair. This all seems important, as if it cannot wait till we fully stop, but I am sure we would all change our minds if we actually felt our own hearts drop. We only bother to take caution once we know what’s on the other side, when the fear becomes real and it’s too late for a second try. You always know the sound of my leash wakes me up. It’s my favorite way to start the morning. You and I take our walk every day, except Sunday, because Sunday is cuddle day. I jump out of bed and run to you, laughing at my eagerness. As soon as you hook the leash to my collar, I nearly yank you out the door. We begin our usual route and you talk to me about the rest of our day. There’s a new episode of your favorite show airing today, so after you shower, we’re going to cuddle up on the couch with a late breakfast. In the middle of your sentence, you look down at your phone. We keep walking to the intersection and I hear a car coming, so I sit by the stop sign and turn to you. You would’ve kept walking right into the car’s path if I hadn’t tugged on my leash and gotten your attention away from your phone. It’s okay, I know you get distracted easily, that’s why I’m here to keep you safe! You and I walk back home while you hum that song you played on repeat yesterday. While you heat up your food, I eat from my freshly filled dish and jump on the couch right at the beginning of the episode. You give me some bacon and after about fifteen minutes, I fall asleep. I woke up when you got off the couch at the end of the episode to go get groceries for dinner. I decided to finish my nap until you got home. When the keys rustling in the door woke me up and your mom and sister walked in, it surprised me. You never mentioned they would be visiting. It surprised me even more when I saw that they were crying. I ran over and began swatting at and rubbing against their legs, trying to make them stop. More people come in behind them and they all look sad. Why are they sad? Why are they here? Are you supposed to be here making them feel better? I curl back onto my bed to get out of the way and bring my stuffed squirrel you gave me for Christmas with me. Everybody gets quiet and turns to your sister, who says through tears that you were too distracted to see the other car. What other car? Why did you need to see it? Your sister begins crying again so I get up and rub against her legs and roll over at her feet to try and cheer her up. That’s how I can always help you feel better, but when she bends down to rub my head, she cries harder. I hope you can help her feel better when you get home. You always seem to know how to make everybody feel better. Maybe she just doesn’t know that you get distracted as easily as I know. So…. I’ll just keep waiting on the couch for you to come back home. I can’t wait to cuddle tomorrow! Don’t leave your pets wondering why you never came back home. Focus on the road and put the distractions away.